YouTubeA scene from Pennsylvania Gov. Tom Corbett’s (R) Halloween-themed campaign ad. Friday is Halloween and Election Day is next Tuesday — so political campaigns are doing their best to connect the two with some groan-inducing puns. Texas GOP gubernatorial candidate Greg Abbott sent out a fund-raising solicitation comparing trick-or-treating to “unhealthy handouts” from the government. “This evening, you may have children in costumes knocking at your door for unhealthy handouts. Speaking of … if Wendy Davis is elected, Big Government will be knocking at your door — and they will be asking for more than candy. We need your contribution today to stop them,” the campaign wrote. But the puns didn’t stop there. “While the Halloween costumes may be enough to give you the creeps — even more terrifying is what your taxes will look like if Sen. Wendy Davis and her allies succeed in turning Texas blue and monster-mashing the state’s economy into the grave,” the Abbott email continued. Majority Leader Harry Reid (D-Nevada) also fired off a Halloween-themed fund-raising solicitation bashing conservative megadonors Charles and David Koch. 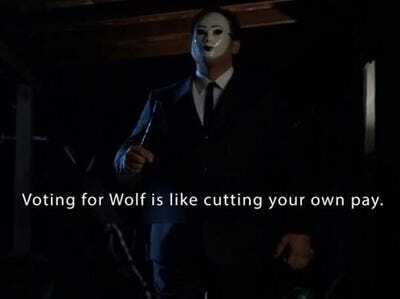 “You know what a scary Halloween costume would be? Dressing up like a Kochtopus,” Reid wrote to supporters. Pennsylvania Gov. Tom Corbett (R) even released a Halloween-themed television ad. “You think this is scary? 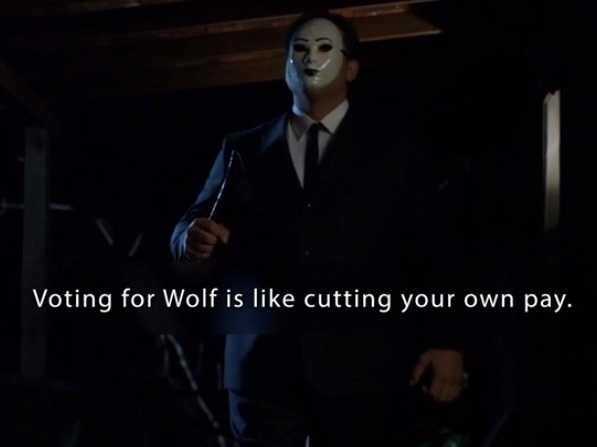 Have you seen Tom Wolf’s plan for raising the state income tax?” a chainsaw-wielding man narrates. 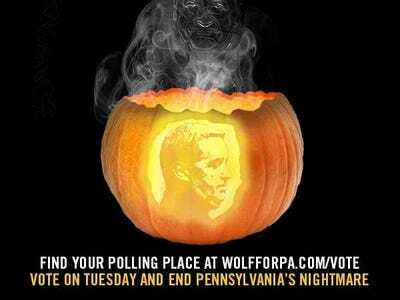 Corbett’s opponent, Tom Wolf, also got in on the action with a “Scary pumpkin” email. “Corbett’s record of cutting $US1 billion from public schools and leading Pennsylvania to dead last in job growth is scary enough. So, if we want to end Pennsylvania’s nightmare, we’ve got to get out the vote,” the email said. Tom Wolf’s campaignA photo from Pennsylvania gubernatorial candidate Tom Wolf’s campaign email. Independent US Senate candidate Greg Orman’s campaign, meanwhile, sent out a campaign press release that filled six paragraphs with Halloween puns blasting Sen. Pat Roberts (R-Kansas). “This Halloween, we want to document how many places in Kansas we can find Ghost Pat Roberts. Is Ghost Pat Roberts at your Halloween party? Is Ghost Pat Roberts sitting at your kitchen table? Maybe you went trick or treating at Ghost Pat Roberts’ home in Kansas … Oh wait — yeah, maybe not,” the statement said.